"Dr. 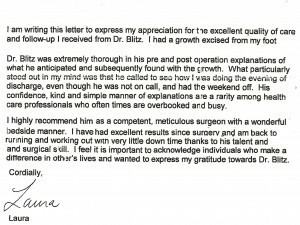 Blitz was extremely thorough"
“I am writing the letter to express my appreciation for the excellent quality of care and follow-up I received from Dr. Blitz. I had a growth excised from my foot. Dr. Blitz was extremely thorough in his pre and post operation explanations of what he anticipated and subsequently found with the growth. What particularly stood out in my mind was that he called to see how I was doing the evening of discharge, even though he was not on call, and had the weekend off. His confidence, kind and simple manner of explanations are a rarity among health care professionals who often times are overbooked and busy.